Innovations on the microscale depend on understanding the behavior of electricity on the smallest of length scales. Scientists have a good grasp of "electrical breakdown," when electricity jumps across large gaps and creates plasma; however, researchers have had little insight into the behavior of electricity as it jumps across very small gaps until now. A team reports research that shines light on electrical breakdown for the smallest gap distances ever studied: 5 to 10 microns.Breakdown morphology at gap widths from 1 to 20 micrometer: (a)-(c) breakdown propagating along the shortest path with luminescence filling the surrounding area; (d)-(f) roughly constant path lengths regardless of gap width, which is consistent with the plateau of breakdown voltage in this region; and (g)-(i) no obvious breakdown channel arising at these smallest gap distances. Credit: G. Meng, et al. Innovations in microscale electronics, medicine, combustion and scores of other technologies depend on understanding and predicting the behavior of electricity on the smallest of length scales. Scientists already have a good grasp of a phenomenon known as "electrical breakdown," when electricity jumps across large gaps and creates plasma. However, researchers have had little insight into the behavior of electricity as it jumps across very small gaps—only a few thousandths of a millimeter—until now. 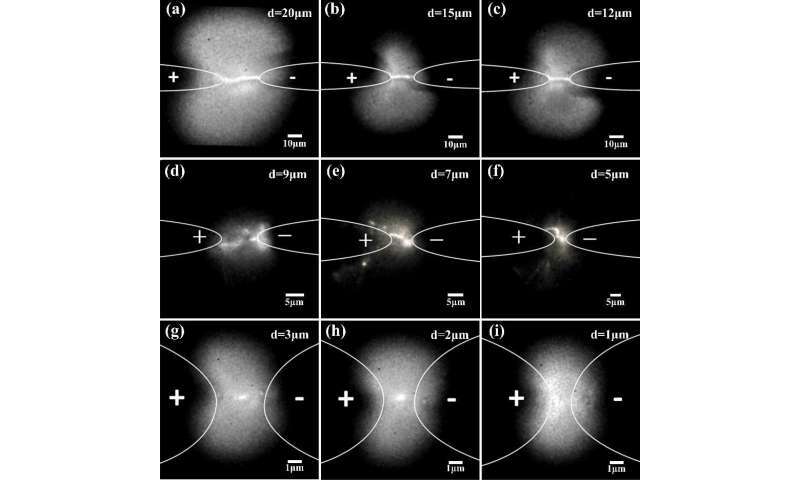 "Our study shows the transition between gas breakdown mechanisms, or the process by which the gas becomes conductive, and the discharge path length—essentially how the electrons flow during their collisions with gas molecules, at very small scales," said Allen Garner at Purdue University in West Lafayette, Indiana, and co-author of the paper published in the Physics of Plasmas. Still don't get it. Every field center responds, collectively, duh. Path? For charge centers or the potential? Well the objects in the path and the object moving is something well understood. I don't understand, only the field center exist. What you doing is trying to measure something you have not properly defined. It's not like we don't know!